When it comes to a stylish themed wedding ceremony, a burlap-themed wedding is natural, strong, distinctive and neutral in color, allowing it to mix with almost any other shade, bright or subtle, decorating your ceremony space or reception beautifully. 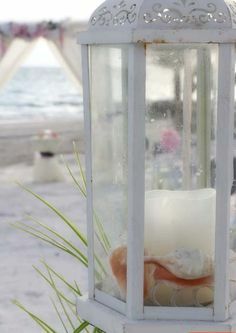 From sashes on the chairs, to full drapes on the arch, a burlap themed wedding blends with the sandy tones on the beach and matches especially well with brown sugar starfish. For a hint of brightness, crystals contrast with the burlap fabric bringing a delicate glint to the material. As a table runner at the reception or as a base cover around a jar topped with delicate lace, the options are endless and your imagination can run wild. At Suncoast Weddings we can make your burlap themed wedding stylish and contemporary. Shades of white or ivory look beautiful against the fabric, although if you want a shade closer to the material's own hue, consider champagne sashes. Delicate Baby's Breath flowers are a favorite to partner this theme - they look bountiful added to a bouquet and add style and romance when placed in mason jars along the aisle chairs, hanging from hooks or freestanding as aisle markers. We have many themes to choose from, or we can tailor something new just for your day.